The Distinction Between a Walking and a Running Gait and How It Applies to the Patterson Film. Once a human begins to run, the style that is used changes markedly from the walking or jogging gait. The leg kicks back at or near 90 degrees. The foot strikes further out in front and the tracks of a runner mostly line up in a straight line one behind the other. 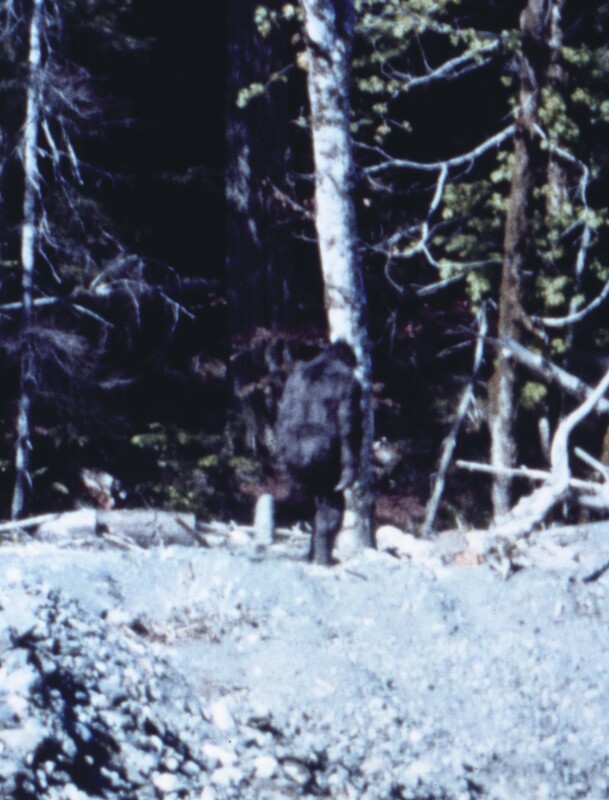 This is the same type of gait or style that is observed in the first walk sequence of the Patterson Bigfoot film. The only difference is that the subject is moving at a too slow a rate to maintain the running style so…the Bigfoot in this walk sequence is a moving contradiction. When that part of the film is sped up, however, the Bigfoot begins to run more normally and the measured approach of the camera person begins to look more “normal” as well. I have said before that the film is edited and has at least two parts to it. The early part was more shaky and unstable, but contained the Sasquatch running. There was an attempt, in my opinion to interlace the two films as one film with some clever maneuvers one of which was to slow down the first walk sequence to match the speed of the second walk sequence. This would mean that the first sequence was shot a higher frame rate than the first and did not suffer from flicker for slowing it down. This would also indicate that the two sequences were shot at different times. The reason why I say that is that a light meter was typically used to determine frame rate and exposure. If the first sequence was at a higher frame rate, then the meter called for that rate meaning that the ambient light was brighter and the area better lit than that of the second walk sequence. It would be inconceivable for a man to be shooting a documentary and not have the light meter to go by as the film would be wasted if under or overexposed. Here are the inline tracks of a human runner on wet sandy substrate. 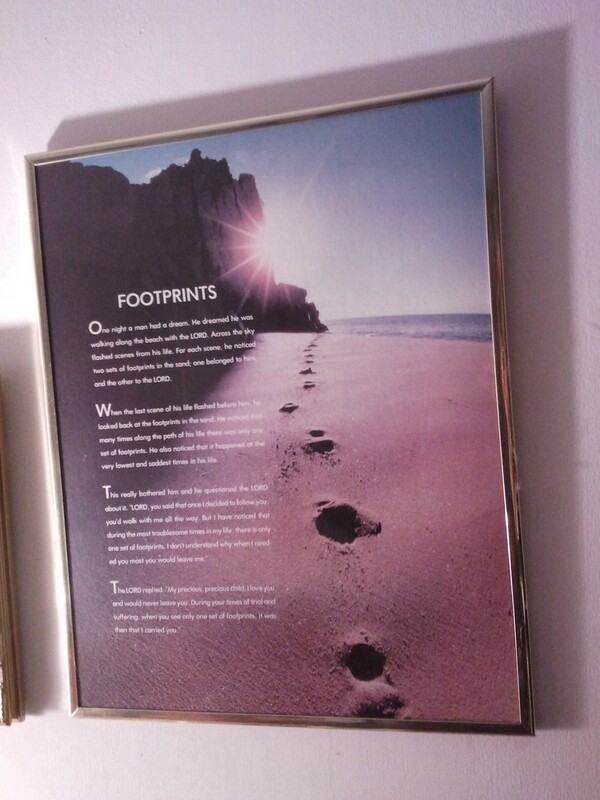 Notice too that the footprints contain the hump in the middle commonly referred to as the “mid tarsal break”. As you can see here this is more a factor of the running style than the construction of the foot. Run on a beach yourself and you can make these yourself. Click on the image to enlarge. 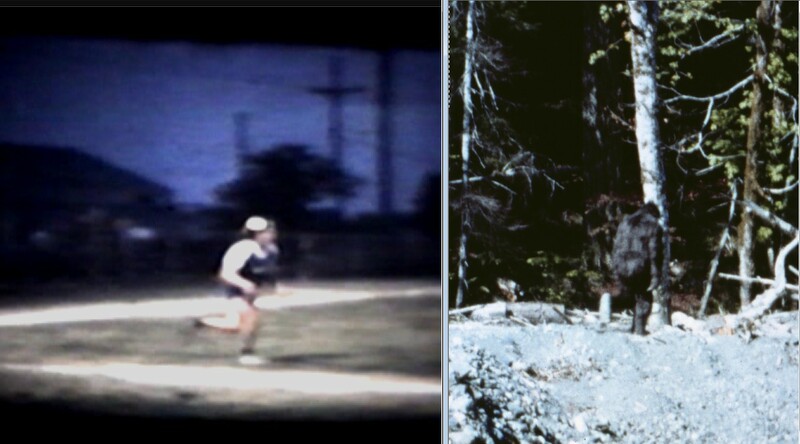 In this photo…Patty on the right is compared to a human runner also caught on film. It should be clear that Patty is in a running gate with the high leg projected at or near ninety degrees. When she was in the first walk sequence, she was in this style of running, but she was deliberately slowed down to walking speed. This is what gave her her “inhuman” look. Running….but going nowhere. This is the earliest part of the film properly sped up. In this clip both walk sequences are together with a slight delay at the end of the first so that the viewer can see that the scene has changed. The first walk sequence is a film of the subject in a running gait with the feet kicking back and high to show the camera the entire foot bottom. In this gait the foot tracks will be in a straight line. The second walk sequence is a “walking” gait and is of a normal speed. What I believe happened is that the first was filmed somewhere around 24-30 fps. To make it match with the second walk sequence so that the film would appear continuous, the first sequence was slowed down. This causes the subject to maintain a running “style” or “gait” but not achieve the speed to maintain it. This causes the subject to look awkward and lumbering. When the first walk sequence is sped up, it begins to look more normal for a running posture. The second walk sequence is walking with no running gait. This first segment shows a running human gait. I believe that it was deliberately slowed to make it appear that she was just walking. The second walk sequence is a genuine walk. This is not evidence of a hoax. This film, in its best form clearly shows a living breathing subject. What this does show is a deliberate attempt to edit and manipulate the film to fit a scheme or agenda. A REAL film of a REAL Sasquatch but made to appear to back up an untruthful story about how the film came about and the nature of what it is that is on it. The Patterson Bigfoot Film…How Fast is the Camera Running? The first walk sequence. In this sequence the subject shows a gait that is consistent with a running human i.e. feet are in a straight line and the back leg is lifted high. If she is running, then why is she moving so slowly? Click on the image to enlarge. This is the first walk sequence where the subject displays a “running” gate. When the film is sped up the gait makes more sense. The Patterson film is edited with each segment shot separately and independently. Click on the image to enlarge.